Protecting sensitive information and authenticating data is crucial for lots of non-PC device applications. But everything depends on the quality of the crypto engine you choose. And while there are a lot of security packages out there, most are missing critical standards, algorithms or pieces that you'll need to field a full solution. 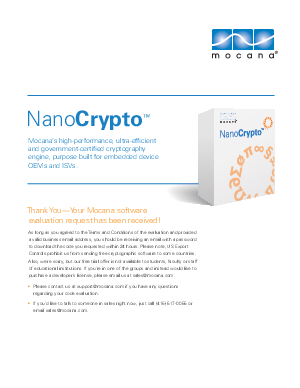 Mocana's NanoCrypto is the industry's most popular and most complete cryptography engine designed for embedded systems, including everything you need to add sophisticated cryptographic security features to almost any type of embedded device or application, all in one package. NanoCrypto is FIPS 140-2 validated, platform independent, and one of the smallest and fastest cryptographic cores on the market. Download the NanoCrypto whitepaper and receive a free trial.